Abarth is celebrating achieving a new Guinness World Record after one of its 124 spider models achieved the ‘fastest figure of eight, five times between two cars’ in 45.66 seconds. The vehicle used had no modifications made to the engine, gearbox, chassis or brakes. The car’s electronic stability program (ESP) was also turned off to allow the Abarth 124 spider to be controlled using the handbrake, and the tyre pressures were increased to compensate for the abrasiveness of the surface. Alastair, a Master Instructor at Stunt Drive UK, holds multiple Guinness World Records for precision driving including the ‘Tightest Reverse Parallel Park’ and ‘Tightest Single Parallel Park’. Gerry Southerington for Abarth UK commented, “We’re delighted that Alastair chose the Abarth 124 spider for this record attempt. Abarth have a long history of setting records in the past and it’s great to have added a new one. The Abarth 124 spider is fitted with a 1.4 MultiAir Turbo 170hp engine reaching 62mph in 6.8 seconds and a maximum speed of 144mph while returning a combined cycle and emitting 148g/km CO2 for the manual. The 1.4 MultiAir Turbo engine has a combined cycle of 44.1mpg for the manual and 42.8mpg for the automatic. Stunt driving duo Alastair and John Moffatt have successful achieved a new Guinness World Record for the Tightest Drift into Parallel Park and now jointly hold this world record. The record attempt was undertaken for CBBC TV Programme Officially Amazing and filmed during the summer of 2017, held under BBC embargo until today when the programme aired. This is the second Guinness World Record the pair have jointly held, the last record they jointly held was for the Tightest Single Parallel Park and was the first record they both achieved. Together they also hold the record for the Tightest Double Parallel Park, and Narrowest Gap Driven through on Two Wheels Simultaniously. We are delighted to announce our next Guinness World Record attempt will be shown on CBBC on Friday 13th July 2018 at 1725hrs. This episode of Official Amazing will feature stunt driving Moffatt Brothers Alastair and John go head to head in a battle to achieve the record for the Tightest Drift into Parallel Park . . . . but who will be the victor?! Tune in to find out! We are delighted to be undertaking an official Guinness World Record Attempt this weekend at the wonderful Chateau Impney Hill Climb near Droitwich. Stunt Driver Alastair Moffatt will use an Abarth 124 Spider to attempt to break the record for the fastest time to complete 5 figure of eight drifts around two parked cars. Alongside his World Record Attempt, Alastair will also be driving an Abarth 595 on two wheels, in between the competition runs being undertaken by over 200 historic cars. Final preparations are being made for this year’s Abarth Day which is being held this Saturday 30th June at Rockingham Speedway. This year’s event is expected to be the biggest Abarth Day held to date. The exciting activities include the opportunity to drive the 595 and 124 spider range on track, 124 drift experience, 595 auto test, hot lap passenger rides and classic cars. On Friday 29th June, Abarth owners take to the track in their cars for an exclusive ‘Scorpionship Track Event’. The event starts at 2pm and will finish at 6pm with a barbeque and there are a few remaining tickets available. Only members of Abarth’s official club ‘The Scorpionship’ can attend at a cost of £79 which also includes a complimentary guest ticket and free access to Abarth Day the next day. To join ‘The Scorpionship’ visit: www.scorpionship.abarth.com. ALASTAIR MOFFATT ACHIEVES A BRAND NEW GUINNESS WORLD RECORD FOR THE FASTEST TIME TO DRIVE A CAR ON TWO WHEELS BETWEEN TEN PARKED CARS! Stunt Driving guru Alastair Moffatt has taken on and conquered the new challenge of driving a car on two wheels between ten parked cars for the next series of CBBCs’ Officially Amazing World Record Breaking Programme. o This amazing feat was recorded during the summer of 2017, with the outcome held under BBC embargo until the programme aired earlier today. This Guinness World Record is calculated by timing how long it takes to drive a car on two wheels between ten parked cars and marks one of Alastairs greatest challenges to date. Dropping the car back down onto four wheels, its side or touching any of the parked vehicles invalidates the record attempt. This attempt is the latest Guinness World Record achieved by Alastair who is delighted to add this title to his ever expanding GWR collection which includes coveted titles such as the Guinness World Records for the Tightest Single Parallel Park, Tightest Reverse Parallel Park and Tightest Gap Driven through on Two Wheels. Alastair was supported by three generations of the Moffatt Family during this attempt, with the familiar faces of his brothers, John and Trevor being joined by father Bill, son William and wife Gemma. Alastair commented This record means a lot to me because it is the first Guinness World Record my son has been part of. He was only 2 years old when this was recorded, but he loves his toy cars and practices parallel parking at home in the kitchen all the time. I’m delighted that I was able to achieve a record when he was part of the Moffatt Family Team supporting me. Alastair Moffatts’ astounding display of precision driving is available on BBC iPlayer. Stunt Drive UK is the leading provider of car based stunt driving experience days in the UK. With four venues located throughout England and Wales, visiting members of the public can learn to perform stunts from the movies such as High-Speed Parallel Parking, J Turns and Driving a Car on Two Wheels. ALASTAIR MOFFATT ATTEMPTS A BRAND NEW GUINNESS WORLD RECORD FOR THE FASTEST TIME TO DRIVE A CAR ON TWO WHEELS BETWEEN TEN PARKED CARS! Stunt Driving guru Alastair Moffatt takes on the new challenge of driving a car on two wheels between ten parked cars for the next series of CBBCs’ Officially Amazing World Record Breaking Programme. o This amazing feat was recorded during the summer of 2017, with the outcome held under BBC embargo until the programme airs on Friday 4th May at 5.25pm. This attempt is the latest Guinness World Record Attempt undertaken by Alastair who hopes to add this title to those he already holds such as the Guinness World Records for the Tightest Single Parallel Park, Tightest Reverse Parallel Park and Tightest Gap Driven through on Two Wheels. Alastair Moffatts astounding display of precision driving will be shown on CBBC on 4th May 2018 at 5.25pm, and will also be available on BBC iPlayer shortly afterwards. We are delighted that our latest Guinness World Record Attempt will be shown at 5.25pm on Friday 4th May on CBBCs' record breaking programme Officially Amazing! Tune in to find out what we have been up to! We are disappointed to advise that stunt driving experiences scheduled for 3rd and 4th March 2018 have been cancelled due to extreme weather conditions with several centimeteres of snow forecast for North Weald Airfield over the weekend. We apologise to affected customers, and ask you to get in touch to rebook your experiences with us. This amazing feat was recorded for CBBC’s Officially Amazing on 12th September 2016, held under BBC embargo until the programme aired on Wednesday 31st May 2017 at 5.30pm. The Guinness World Record has now been reduced to a combined gap of 1.29m. This Guinness World Record is calculated by adding the width of both cars and subtracting this measurement from the distance between the two markers defining the gap. The two cars are then driven through the space without touching either of the markers or each other. This latest record is an addition to the collection of records the pair already hold. Alastair, a Master Instructor at Stunt Drive UK also holds Guinness World Records for the Tightest Single Parallel Park, Tightest Reverse Parallel Park and Tightest Gap Driven through on Two Wheels. Whilst John and Alastair jointly hold the Tightest Double Parallel Park, Tightest Triple Parallel Park and Fastest Time for Three Cars to Complete Ten Donuts in a Fan Formation with their brother Trevor. The Moffatt Brothers astounding display of precision driving is also available for viewing on BBC iPlayer. This amazing feat was recorded for CBBC’s Officially Amazing on 15th July 2015, held under BBC embargo until the programme aired on Monday 23 May 2016 at 0745hrs. The Guinness World Record has now been reduced to a combined gap of 41cm. 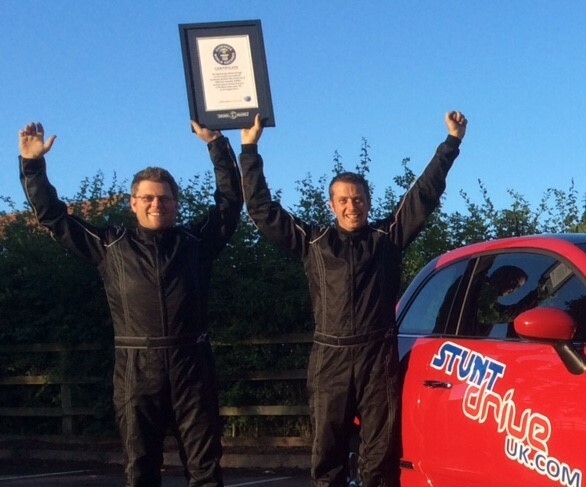 Gloucester based stunt driving Brothers, Alastair and John Moffatt have reclaimed the Guinness World Record for the Tightest Double Parallel Park during filming for CBBC programme Officially Amazing at Bentwaters Airfield on 15th July 2015, at a distance of 41cm, kindly provided by Fiat UK. This Guinness World Record is calculated by adding the length of both cars and subtracting this measurement from the distance between the two parked cars. The two cars are then parked into the space without touching either of the parked cars, each other and within 30cm of the kerb line. Alastair, a Master Instructor at Stunt Drive UK also holds Guinness World Records for the Tightest Single Parallel Park, Tightest Reverse Parallel Park and Tightest Gap Driven through on Two Wheels. Whilst John and Alastair jointly hold the Tightest Triple Parallel Park and Fastest Time for Three Cars to Complete Ten Donuts in a Fan Formation with Alastair. Commenting on their achievement, John noted, “With a team World Record its really important that both of us are at the top of our game at the exact same time. Its taken lots of practicing to achieve this record today and create a new precision driving record” The Moffatt Brothers’ astounding display of precision driving is also available for viewing on BBC iPlayer. Stunt Driving Brothers, Trevor, Alastair and John Moffatt have secured a new Guinness World Record for the Fastest Time for Three Cars to Complete Ten Donuts in a Fan Formation. This amazing feat was recorded for CBBC’s Officially Amazing on 28th August 2015, held under BBC embargo until the programme aired on Friday 26th February 2016. Gloucester based stunt driving Brothers, Trevor, Alastair and John Moffatt have claimed a new Guinness World Record for the Fastest Time for Three Cars to Complete Ten Donuts in a Fan Formation during filming for CBBC programme Officially Amazing at Bentwaters Airfield on 28th August 2015, in a time of 54 seconds. This new Guinness World Record is calculated by timing how long it takes three cars to perform ten complete rotations around a central point without touching and within an outer perimeter. Alastair, a Master Instructor at Stunt Drive UK also holds Guinness World Records for the Tightest Single Parallel Park, Tightest Double Parallel Park and Tightest Gap Driven through on Two Wheels. Whilst John also jointly holds the Tightest Double Parallel Park with Alastair and the trio also jointly hold the record for the Tightest Triple Parallel Park. Commenting on their achievement, John noted, “With a team World Record its really important that all three of us are at the top of our game at the exact same time. Its taken lots of practicing to achieve this record today and create a new precision driving record” The Moffatt Brothers’ astounding display of precision driving is also available for viewing on BBC iPlayer. Stunt Drive UK is the leading provider of car based stunt driving experience days in the UK. With four venues located throughout England and Wales, visiting members of the public can learn to perform stunts from the movies such as High-Speed Parallel Parking, Donuts and Driving a Car on Two Wheels.